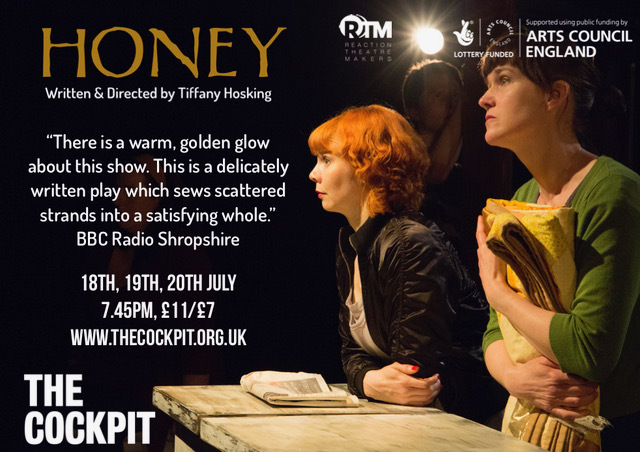 Honey is an intriguing prospect: a story centring around a small family in Wales as they struggle to navigate the daily anxieties of waiting for loved ones to return from military service. Over the course of the tale they employ a range of activities to occupy themselves – from raising bees to selling honey to stitching together a quilt which seeks to ‘anchor’ them to the rural landscape around them – but frequently find their peace disrupted by the emotional turbulences of this small, close-knit community, not to mention the distant, ever-present spectre of war. The performers are all fantastic, bringing life to these characters and ringing every drop of emotion from the (at times) slightly wordy writing. There are some wonderful uses of movement too – the almost conversational dance between Caron and his auntie in which they gently reconcile after an argument is a particular highlight of the second half. Callan Durrant does a lot of compelling emotional work with an almost wordless part, and Vey Straker and Jemma Lewis are equally strong as his mother and auntie. 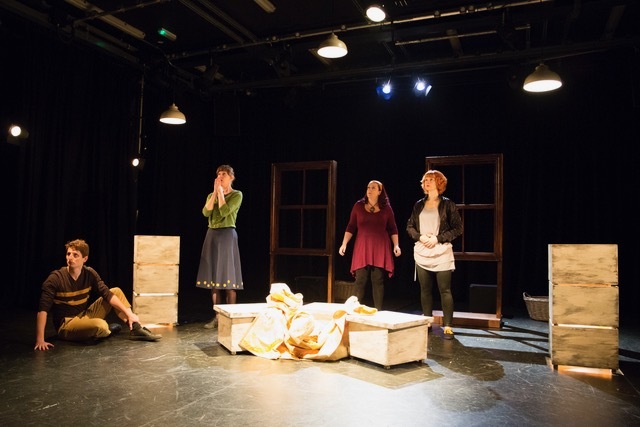 There is also a standout performance from Jenni Lea-Jones as the pair’s half-sister: her monologues on her fears for her son as he works abroad as a bomb disposal expert are beautifully delivered and provide several of the show’s most touching, heartfelt moments. 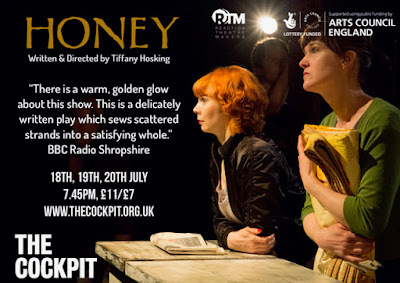 The set is also very ingeniously put together – the three beehives transform seamlessly into seats and hills and bars and shop counters, and the gentle background murmurings of bees and birdsong and folk music help to conjure up the sense of a small community cut off from the rest of the world. The play takes a brief jump into more existential territory in the second half which I must admit had me a little bit lost. The writing’s at its best elsewhere when it’s examining the significance of the small, heartfelt moments between these characters – Anwen’s delight that Caron has learned to sew by watching her work, for example, or the moment of spontaneous laughter between the three sisters at a shared childhood memory. The story roves across a wide range of territory on love, loss, and community, and raises a number of thought-provoking questions on what it might mean to feel out of step or left behind. I’m intrigued to see what this group will put together next.